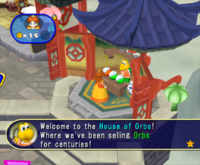 Orb Huts, sometimes referred to as Orb Shops, are shops that appear in Mario Party 6 and Mario Party 7 in which players and characters can buy Orbs to use against an opponent, on themselves or lay them down on a space to create a Character Space. In Mario Party 6, Koopa Troopas or Shy Guys are the shopkeepers, depending on what time of day it is (Koopas during the day, Shy Guys at night). In Mario Party 7, one of three shopkeepers (Goombas, Koopa Troopas, and Shy Guys) appear on two different boards, with special clothing depending on what board the party is being played at. For example, Koopas wear Hollandic women clothes in Windmillville, but they wear Chinese clothing instead on Pagoda Peak. They were replaced by Candy Shops in Mario Party 8. 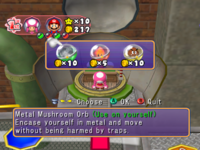 Before Orb Huts were introduced into the series, players could get the Orbs (then called capsules) for free from capsule machines in Mario Party 5. This page was last edited on January 20, 2019, at 20:11.